Let us keep you informed about new products, offers and events by signing up to our newsletter. Seaweed & Dead Sea thalassic detox bath soak treatments for problem skin, injuries, muscular tension, arthritic pain, fatigue and rehabilitation. Info: Dead Sea salt & Seaweed bath soak treatments help sooth irritated skin, benefiting eczema, psorisis, rashes, acne and spots. The Seaweed (bladderwrack) contains vitamins and B vitamins, calcium, proteins, minerals, iodine, antibacterial, antiffungal, antioxidant and anti-inflammatory properties. The sap from the bladderwrack is healing and moisturing, leaving skin like silk. Both bladderwrack and Dead Sea salts are packed with minerals that melt muscular tension and spasms and ease stiff joints. Ingredients: Dead Sea salt & eco-friendly hand harvested bladderwrack. 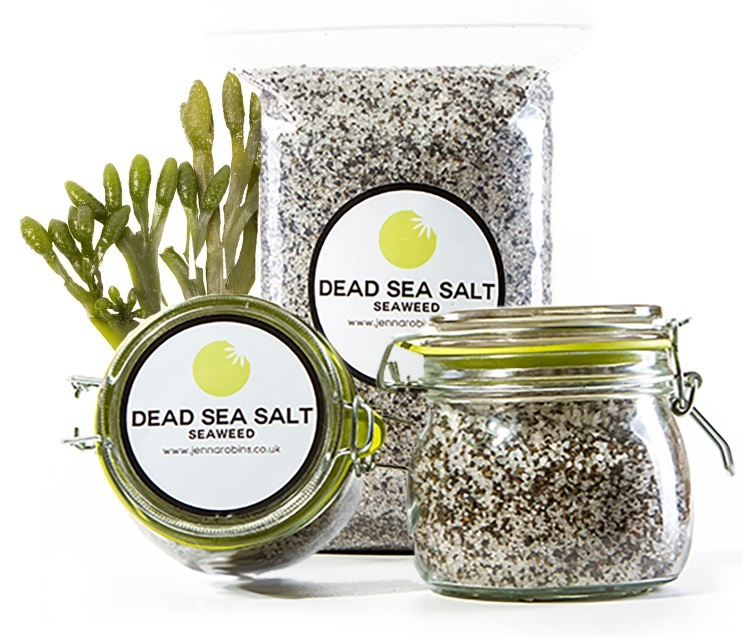 A 1kg refill bag of Dead Sea salt & seaweed is also available. Refill bag contains approximately 8 x detox bath soaks. Contraindications: Note seaweed contains iodine, so please condult your GP if you have a hyper-thyroid condition. Free P&P on all orders. All orders are sent by Royal Mail Tracked 48. Deliveries will normally arrive within 2 working days of being despatched, but please allow up to 5 working days. A signature is required upon receipt of your delivery. Royal Mail working days are Monday to Saturday. Please note we are currently unable to ship outside the United Kingdom. If you are not 100% satisfied with your purchase, you can return the product and get a full refund or exchange for another Jenna Robins Botanical Science Detox Seaweed Face Kit. Simply print off and complete the returns form and then return with the full product within 30 days from the date you purchased. You must cover the cost for returning any unwanted goods and as long as we receive them back in good order (i.e. in a fully resaleable condition including all original packaging materials), we will refund your purchase. Please check that your postal service is insured. If the goods arrive back to us damaged, unfortunately we will not be able to refund you. Let us keep you infirmed about new products, offers and events by signing up to our newsletter.